Hey, Don't Touch Link There! If you didn't know already, The Legend of Zelda: Phantom Hourglass was released yesterday in the United States for the Nintendo DS. I want this game really bad, but because I put it on my birthday list and my birthday is at the end of this month I have to wait... Just so you know, if I don't get it for my birthday, I will be buying it anyway ;-). Why do I want this game? First, it's Zelda. If I had to rank them, Zelda is probably my favorite Nintendo franchise. If I was in a room with a crazy cartoon murderer and he told me to choose between Mario and Link, I'd tell him to kill Link. (Because he's a crazy cartoon murderer and crazy cartoon murderers always do the opposite of what you tell them to do, trust me on this one). 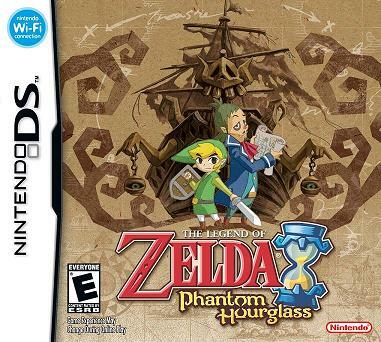 Second, Zelda: Phantom Hourglass is a sequel to my favorite Zelda game: The Wind Waker. Third, this game was one of the reasons I bought a Nintendo DS. Seriously, this game was announced in March of 2006 and I purchased my DS Lite in June of 2006. It was part of my purchasing decision. The controls of this game are very different than any previous Zelda title. You control Link using just the stylus. This is my one trepidation about this game. Animal Crossing had very similar controls and I found myself using the directional pad more than the stylus. As far as I know, Phantom Hourglass does not give you the option to fall back to the D-pad for movement. If I had to pick something that would prevent me from enjoying this game it would be poor controls. What remains to be seen is if my fears are baseless or not. The game sells for $35, and I wouldn't expect it to drop anytime soon. This game sold like gangbusters in Japan (over 350,000 in the first week). Until I play it I can't give it my official approval, but I'd recommend picking it up if you're a Zelda fan of any sort.